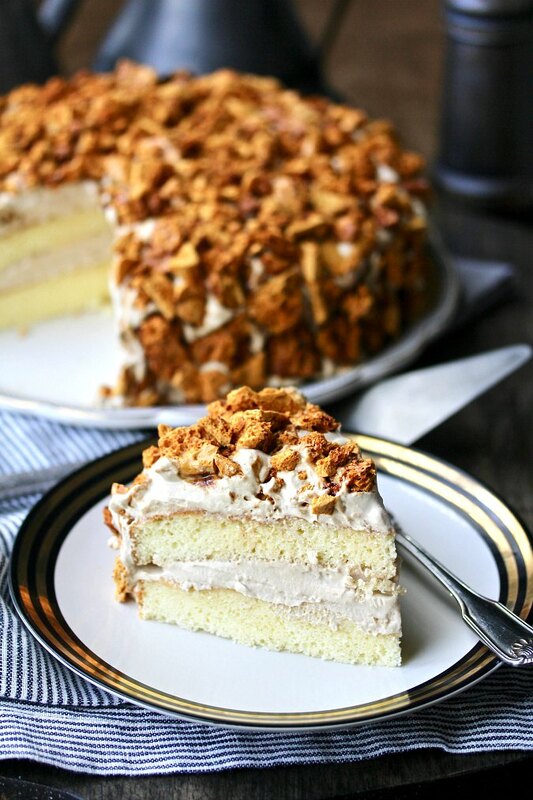 Blum's Coffee Crunch Cake.. a lemon and vanilla chiffon cake with an espresso infused whipped cream frosting and coated with an airy and crunchy coffee honeycomb-like candy. Blum's was a small chain of bakery/soda fountain shops in San Francisco that closed in the 1970s. 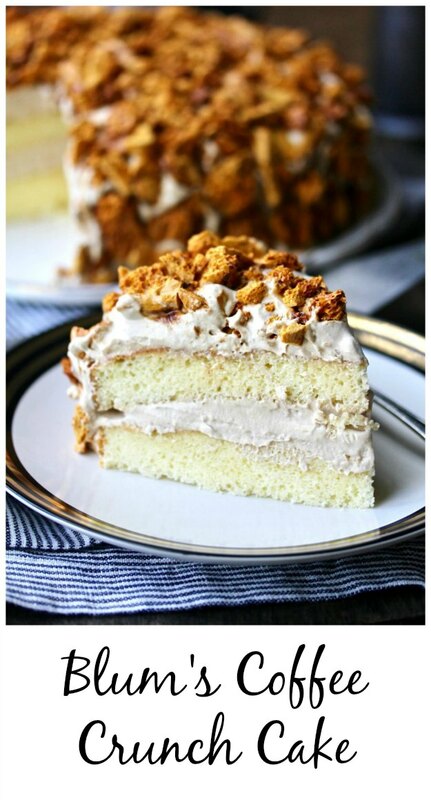 Its most beloved menu item was this coffee crunch cake. The bittersweet candy coating was evidently created when a confectioner made a candy-making error. Instead of ditching the candy, he smashed it and used it to coat a cake. While the idea of lemon chiffon with a coffee flavored topping sounds kind of odd, it actually works! 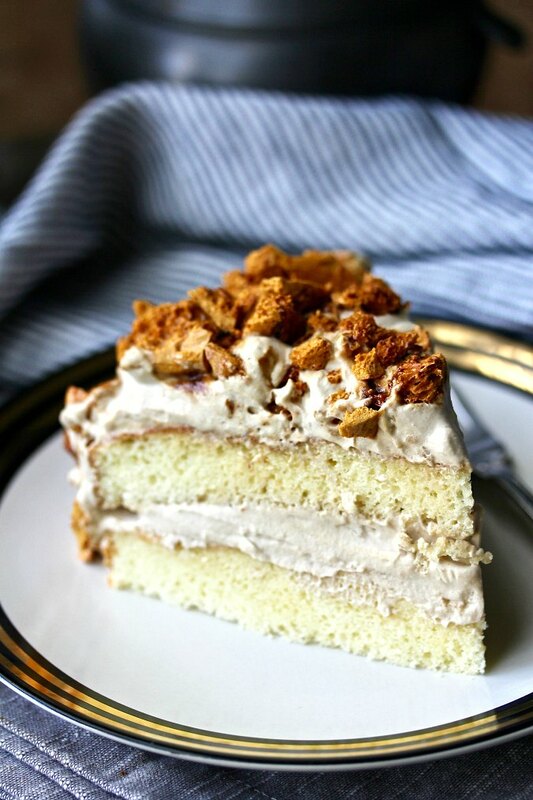 The candy on its own is kind of bittersweet, but when it's nestled in the sweet coffee flavored whipped cream, it mellows and adds just the right amount of texture to the cake. It's pretty spectacular. The candy for this cake is made by adding baking soda to a mixture of sugar, coffee, and corn syrup that has been cooking on the stove until it reaches 310 degree. The mixture bubbles up a lot, so be sure to use a large saucepan. Even when you pour it out to cool, it continues to puff up. You can make the candy for this cake up to two weeks in advance and keep it in an airtight container. Make the coffee candy and let it cool. Once it has cooled, break it up in a zip sealed plastic bag by gently smashing it with a rolling pin. 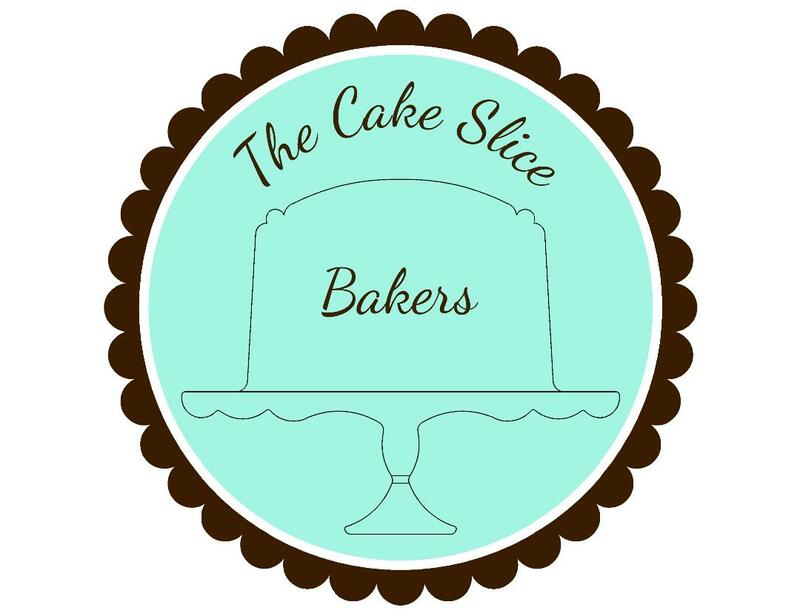 Bake the chiffon cake. It's a single layer that you will slice in half when you are ready to frost the cake. I wrapped my baked cake in plastic wrap and froze it until I was ready to assemble the cake. Make the espresso whipped cream frosting and frost the cake. Once you have frosted the cake, stick it in the refrigerator for an hour to set the whipped cream, lest it collapse under the weight of the candy. 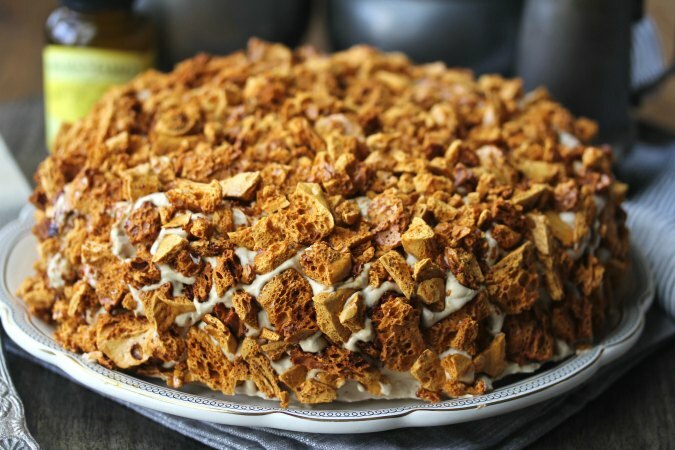 Coat the cake with the coffee crunch candy and serve! This recipe calls for both lemon juice and lemon zest for the chiffon cake. I was out of lemons when I made this cake, so I substituted some Nielsen Massey Pure Lemon Paste (disclosure: I received a sample from the company). It added a nice subtle lemony flavor to the cake. This recipe also calls for adding espresso powder to the whipped cream frosting. It's an amazing secret ingredient, but I've always struggled with they way it hardened into a solid mass in the cupboard. I tried everything, including saving those silica packets to keep this from happening. Finally, I discovered that freezing the instant espresso keeps it powdery. I love whipped cream frosting, but it is tricky when you are planning ahead. I discovered this product for stabilizing the whipped cream so that I can make it somewhat in advance. The recipe I used for this cake is from the book, The Perfect Cake by America's Test Kitchen. They have not granted permission to share the recipe, but here is a comparable version from Serious Eats. This looks delicious and I will definitely try it. Looks great. Ours seems to be getting better and better every day in the refrigerator! It looks so yummy! I really appreciate your hints. Wow, this looks fantastic! I really wanted to make this one but it has been so humid here that I knew I wouldn't get the result I wanted, so I am looking forward to trying it when it cools down a little bit. Also, thanks for the tips, especially for the cream frosting. Thanks Felice. I'm pretty sure you made the right choice with the humidity. OK.. I'm in! I'll be making this! 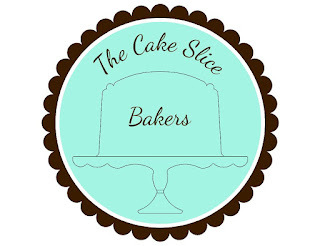 Thanks for sharing at our Cupcake & cake party for Celebrate365 Blog Party!